The mobile games platform is one that is often (and often quite rightly) lambasted for being filled to the brim with clones and copycats of successful titles, making the market an overwhelming bog, which one must wade through to find the gold in the grime. 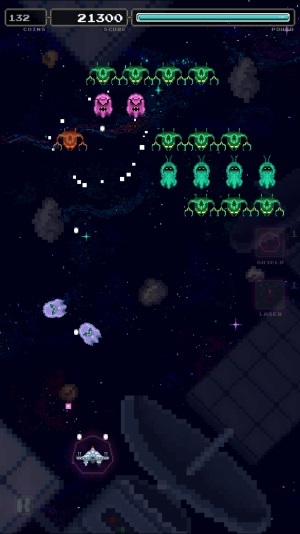 Therefore it’s quite refreshing to have a clearing of the murky waters and find a game that is so heavily inspired by perhaps one of the most copied games ever, Space Invaders, yet still brings new ideas to the table and makes it work really well on a touch screen device. Galactic Nemesis is quite clearly a Space Invaders-alike, and by saying that you already know what the objective is: you control your own little spaceship whilst shooting up at rows of invading aliens above, as they return fire and hope to blow your craft into smithereens. But Nemesis manages to subtly change this formula just enough to make the game feel new, or at least different, but also making it seem very familiar. You could give it to anyone, from your young to child to your grandmother, and I think they’d know what to do instantly. The changes are nothing ground breaking, but they do just enough. Enemies don’t start at the top of the screen, for instance, they enter in waves and then take up formation at the top, and then in coordinated teams they begin to swoop down, in an effort to kamikaze into you, whilst shooting their cannons. It’s not only the enemies that have freedom of movement, as your own spaceship in no longer tethered to the X axis and you can fly whereever you like. I found the controls to be very innovative, with no intrusive on-screen buttons and no clunky motion controls. You maneuver your ship by putting your finger on the screen and moving it around. There’s no separate button to shoot either, your cannons are always firing when you’re pressing the screen. The touchscreen control made the ship surprisingly responsive and resulted in some tense moments where I ducked and dived to evade unrelenting enemies. The simplicity of the mechanic makes the game quite fun. My only qualm is that with my finger always having to be on the screen, my view of approaching enemies was occasionally obstructed, often resulting in my health rapidly reducing. Although, this could be due to the fact I was playing the game on the small screen of an iPhone 4S – your mileage may vary. The added movement from both sides of the battle made for, at least initially, more interesting encounters than I had previously encountered in games of this ilk in the past. However, once I became familiar with the formula it gets a little repetitive. Even though the numerous different foes moved in different ways, which gave me something to think about, they all followed the same pattern of coming in, lining up, swooping down, then repeating. Coupled with the fact that upgrades and extras always dropped at the same points too, the battles become a bit predictable. Galactic is a very pretty game, and I really enjoyed the pixelated, retro art style. The scrolling backdrops, whilst not very long, remain nice to look at whilst playing and the designs of the in game sprites (of which there are lots) are all varied and interesting. They’ve managed to do a lot with in the restraints of 8-bit, which I appreciate. 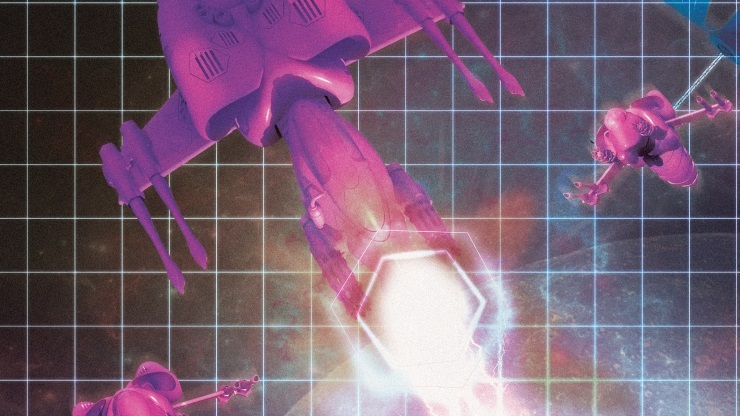 There’s also a surprising amount of game time in Galactic, with four different areas offering twelve stages, with each stage having four waves of attack. With an Endurance version of each stage and the potential for even more coming out in the future, you could certainly put a decent amount of time into it. One thing that does disappoint, is the lack of music. It teases with a really short clip at start of the mission, which gets you pumped for space shooting action, but as soon as you begin, the music disappears. The sounds effects for the weapons and ship damage are all good, but it really lacks a bit of character without a sound track. Also, whilst the challenges I had to complete in every mission appeared to offer replayability and different ways to approach missions, it was actually more of a checkpoint list where I got given extra coins to make (slightly boring) upgrades to my ship after I’d reached a certain point in a mission, which was a little disappointing. Galactic Nemesis may not be the most revolutionary game on the iOS Store, but it certainly isn’t a money grabbing shill, either. It’s clear that a lot of thought, care and effort has been put into it through the really pretty design and various changes made to the old formula. I can certainly think or worse things to do whilst sat on a bus. Can become a little repetitive. Simple, innovative controls and a pretty art style make it a fun game to play when you’ve got time to kill.